One of the things that people don't get about classical music is, precisely, that it's 'classical' - a long, continuous, self-referential tradition, typified by and crystallised around exemplary, 'classical' genres, styles, works, idioms and gestures, a tradition on which composers comment in the very act of adding to and extending it. So trying to find another name for it or pretending that crooning musicals is part of that tradition, is to misunderstand it (innocent) or traduce it (guilty). I'm also not in favour of encouraging people to talk while it's going on. You can do that at home. Unfortunately, another misconception (apart from the fur coat one), which has been abetted by musicology's obsession with dots and dashes, politics and gender, is that performers play little or no part in this tradition or its development; thankfully, that's slowly changing - but it's not going to change any faster if dog-in-the-mangerish copyright laws and corporate ignorance mean we can't hear more than a handful of old performances. If anyone's 'classical', of course, it has always been Palestrina. But I bet no choir or conductor today would think they have anything to learn from this lovely LP, which I am proud to own in a limited, numbered (oops - a fur-coat moment! Darn, rumbled) gatefold sleeve with lovely notes and illustrations, which my scanner can't cope with - clock the mess it made of the cover. I wish I had the Dutch Masters CD of the Netherlands Chamber Choir but, in their wisdom, Philips pre-decided I wouldn't want it - and who am I to argue? The gods of marketing, we are told, are always right. This record was also issued in Britain on Philips NBL 5033, which was well received by Alec Robertson in the May 1956 issue of The Gramophone. Bits of it were also coupled with other things, which Grumpy would love to hear. On side 1, the Missa Papae Marcelli sounded good on the turntable but, oddly, slightly worse after declicking and monoing - perhaps the clean-up made the rumble, traffic and air-con more audible. The 7 fully-tagged mono FLACS are in a .rar file here. I was more worried about the quality of side 2, which is quite full (even though they've omitted the Credo and Benedictus of the Missa ad fugam, about which I can find nothing online). It sounded congested towards the end - and I slightly crashed the zero barrier at one peak - but I feel it's emerged from the wash smelling slightly sweeter. I decided not to chop these masses into movements, so 2 fully-tagged mono FLACS are in a .rar file here. I just found the recording dates amongst Mike Gray's data on CHARM, which I couldn't access last weekend. Sorry, you'll have to correct the 'date' and 'comment' tags. 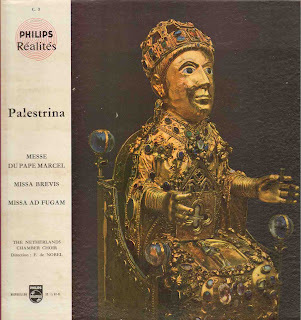 Explains why the Missa Papae Marcelli sounds quite different from the others - it was recorded 2½ years earlier. Thanks a lot for this recording, and for sharing an item from the French Philips Réalités series which was very eclectic (from classical to sketch comedy). "Tin Ear" has just uploaded an other LP of that series, a bunch of Kurt Weil's songs.